栗原麻子、奈良大学文学部世界遺産コース編 (2001年). “2.ヨーロッパの都市 アテネ”. 世界遺産と都市. 風媒社. ISBN 4-8331-4029-2. Connelly, Joan B. (1996-01-01). “Parthenon and Parthenoi: A Mythological Interpretation of the Parthenon Frieze”. American Journal of Archaeology 100 (1): 53. doi:10.2307/506297. http://links.jstor.org/sici?sici=0002-9114(199601)100%3A1%3C53%3APAPAMI%3E2.0.CO;2-C 2007年4月23日閲覧。. Frazer, Sir James George (1998年). “The King of the Woods”. The Golden Bough: A Study in Magic and Religion. オックスフォード大学出版局. ISBN 0-192-83541-6. Hurwit, Jeffrey M. (2005年). “The Parthenon and the Tample of Zeus at Olympia”. In Judith M. Barringer, Jeffrey M. Hurwit, Jerome Jordan Pollitt. Periklean Athens and Its Legacy: Problems and Perspectives. テキサス大学出版局. ISBN 0-292-70622-7. Pelling, Christopher (1997年). “Tragedy and Religion: Constructs and Readings”. Greek Tragedy and the Historian. オックスフォード大学出版局. ISBN 0-198-14987-5. Whitley, James (2001年). 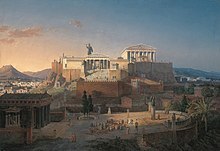 “The Archaeology of Democracy: Classical Athens”. The Archaeology of Ancient Greece. ケンブリッジ大学出版局. ISBN 0-521-62733-8. 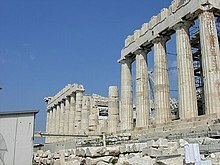 ^ Research has revealed a shrine with altar pre-dating the Older Parthenon, respected by, incorporated and rebuilt in the north プテロン(英語版) of the Parthenon (Pelling, Greek Tragedy and the Historian, 169). ^ Penrose op. cit. pp 32-34, found the difference motivated by economies of labour; Gorham P. Stevens, "Concerning the Impressiveness of the Parthenon" American Journal of Archaeology 66.3 (July 1962:337-338). ^ See e.g. George Markowsky (January 1992). “Misconceptions about the Golden Ratio” (PDF). The College Mathematics Journal Volume 23 (No 1). http://www.math.nus.edu.sg/aslaksen/teaching/maa/markowsky.pdf. ^ See Minott Kerr, "The Sole Witness": The Periclean Parthenon Archived 2007年6月8日, at the Wayback Machine. ^ a b S. Deacy, Athena, Routledge, 2008, p.111. ^ MC. Hellmann, L'Architecture grecque. Architecture religieuse et funéraire, Picard, 2006, p.118. ^ a b B. Nagy, "Athenian Officials on the Parthenon Frieze", AJA, Vol.96, No.1 (January 1992), pp.55. ^ Thucydides 2.13.5. Retrieved September 11, 2008. 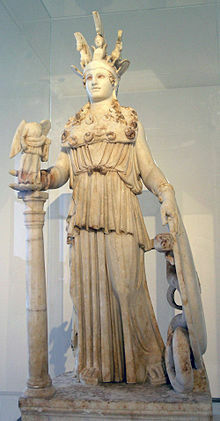 ^ S. Eddy, "The Gold in the Athena Parthenos", AJA, Vol.81, No.1 (Winter, 1977), pp.107-111. ^ B. Holtzmann and A. Pasquier, Histoire de l'art antique : l'art grec, École du Louvre, Réunion des musées nationaux and Documentation française, 1998, p.177. ^ "The Surface Conservation Project"[リンク切れ] (pdf file). Once they had been conserved the West Frieze blocks were moved to the museum, and copies cast in artificial stone were reinstalled in their places. Holtzman, Bernard (2003年) (French). L'Acropole d'Athènes : Monuments, Cultes et Histoire du sanctuaire d'Athèna Polias. Paris: Picard. ISBN 2-7084-0687-6.